PJ33, located on four acres of prime property bordering Sections 13 & 14, Petaling Jaya, is made up of a five-storey podium block comprising two floors of retail space and a three-level car park. The office has high ceilings with more headroom, sturdier floors, better space utilization and ample parking are key to PJ33 Cybercentre. Three existing towers sit on the podium block, providing a total of lettable area of 400,000sf, with another 2 blocks with a total lettable area of 500,000sf slated to be completed by early 2013. PJ33's major office tenants are Bayer, Prudential Insurance, Merck Sharp & Dohme, Sara Lee, Wyeth, Maybank, Electrolux etc. With the confirmation of the MSC Cybercentre status, PJ33 is expected to attract more multi-national ICT companies to locate their Malaysia head office in the development. Three (3) floors of purpose-built Tier-3 data centres will be located at Tower 5 with a total of 57,000 sq ft space, with self-control air-conditioning, security, power, heavy-duty floor loading, greater floor to ceiling height and other technical requirements. It will also come with fiber-optic network. The amenities available within the PJ33 Cybercentre development includes a supermarket, retail outlets, restaurants and cafes as well as meeting/conferencing venues. 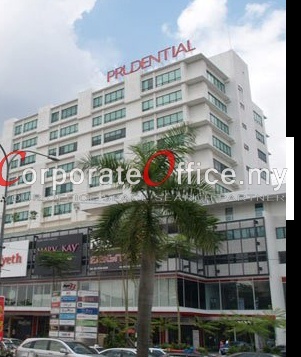 PJ33 Cybercentre is one of the rarely available mixed-development in Petaling Jaya with a retail mall attached to the office buildings. PJ33 Cybercentre, the new business venue where it meets all your expectations under one roof. Call us today at +6014-6262 623 or email us at info@CorporateOffice.my to book for a tour of the prestigious PJ33 Cybercentre office development! No. 2, Jalan 51A/223, Petaling Jaya, Selangor, 46100, Malaysia. No. 1, Jalan PJU 7/6, Mutiara Damansara , Petaling Jaya, Selangor, 47810, Malaysia. No. 3, Jalan PJU 7/2, Mutiara Damansara, Petaling Jaya, Selangor, 47810, Malaysia. No. 15A, Jalan 219, Seksyen 51A , Petaling Jaya, Selangor, 46100, Malaysia.